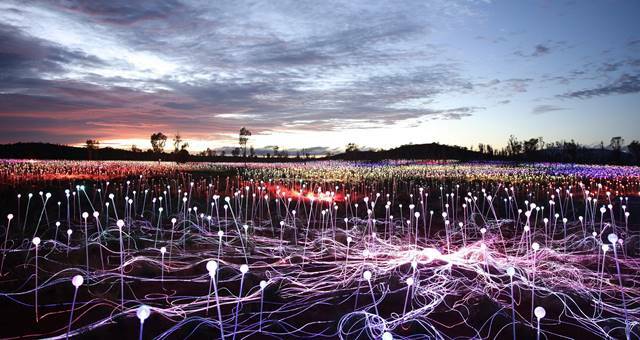 Bruce Munro’s impressive Field of Light installation. Internationally acclaimed artist Bruce Munro’s immersive installation, Field of Light Uluru has been extended for a further period and will now remain in place until 31 December 2020. The award-winning exhibition, located at Ayers Rock Resort in the spiritual heart of Australia, opened on 1 April 2016 to critical acclaim. “With such incredible demand, and high occupancy experienced throughout the year at the Resort, extending the Field of Light to 31 December 2020 will allow even more guests to enjoy this extraordinary experience,” said Voyages Executive General Manager Sales, Marketing and Distribution, Ray Stone. “Since opening, more than 200,000 guests have been deeply moved by the Field of Light, it’s hard not to be. This further extension offers guests the opportunity to enjoy not only the spiritual nature of the destination, but experience it in a unique and mesmerising way,” said Ray. Tourism Australia MD, John O’Sullivan welcomed the decision to extend the exhibition until the end of December 2020. “Field of Light has been a remarkable success and there’s clearly still significant demand amongst people both here in Australia and overseas to make the journey to Uluru to see what is unquestionably one of world’s most spectacular and immersive exhibitions. People travel to experience difference and this is about as unique a way of connecting with one of our country’s most spectacular natural wonders as you’re ever likely to get,” he said. The exhibition, aptly named Tili Wiru Tjuta Nyakutjaku or ‘looking at lots of beautiful lights’ in local Pitjantjatjara, is Munro’s largest work to date, with more than 50,000 slender stems crowned with radiant frosted-glass spheres over an area the size of nine football fields. It is also the artist’s first work to be illuminated entirely through solar power. The spheres, connected via illuminated optical fibre, bloom as darkness falls. Pathways draw viewers into the artwork, which comes to life under a sky brilliant with stars.